Time: 1 hrs. 30 mins. The Glacier Springs Cutoff trail begins from the southwest corner of the parking area. It goes to the right while the Mesa Lake Shoreline and Lost Lake trails go to the left. 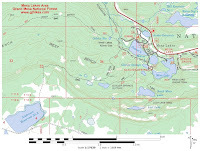 A day use fee is required to drive to the Glacier Springs trailhead. The trail starts out climbing along side of the mountain with a steep slope on the downhill side of the trail. Off to the right is Glacier Springs Reservoir with a few private cabins in the background. It's not uncommon to come upon fallen trees along the trail. A path had been cut through this one but we did encounter several that we had to climb over. Snow can persist well into June at this altitude. There are a couple of spots where the melting snow creates a slough of water to walk either through or around that might not dry up until mid summer during a wet year. Near the end of the trail there is a natural lake off to the left. If you walk down to the shore you might spot something entertaining to watch. 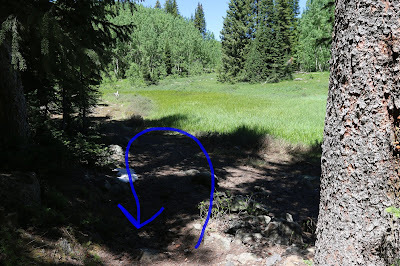 The Rim View trail comes up at the 1 mile point although at present there is another sign for the Glacier Springs Cutoff trail but not one that lets you know you have reached the Rim View trail. We had been to this spot several times in the past and knew where we were but it might be different for those that are here for the first time. We mention that because it would be easy to walk right by the Glacier Springs Cutoff sign without noticing. Mosquitoes can usually be counted on until it warms up and dries out. Around water mosquitoes can persist until it starts getting down around freezing at night. Fortunately they weren't a real bother on this hike. 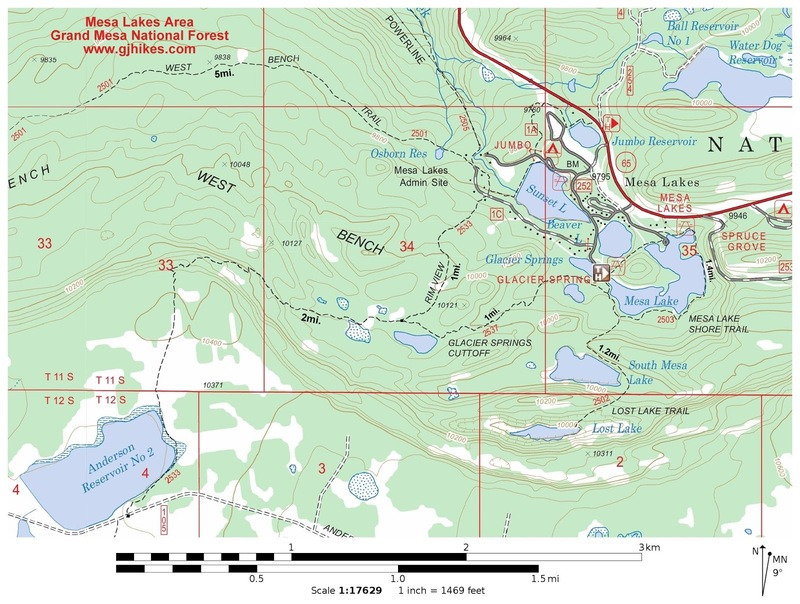 The Glacier Springs Cutoff trail is a nice option in the Mesa Lakes Area. If you would like to see it for yourself then all you have to do is 'Take a hike'. Send an email to gjhikes@yahoo.com. Copyright by gjhikes.com - All photos and maps may be freely used for non-commercial purposes when accompanied with a caption giving credit to gjhikes.com.